As the automobile became more widely available in the 1920s, the idea of living in the suburbs became far more appealing to Americans. Residents of large cities sought to escape increasingly crowded streets (thanks to industrialization), and with newly paved roads and auto ownership, taking on a commute was well worth the space and comfort that was paid out in return. 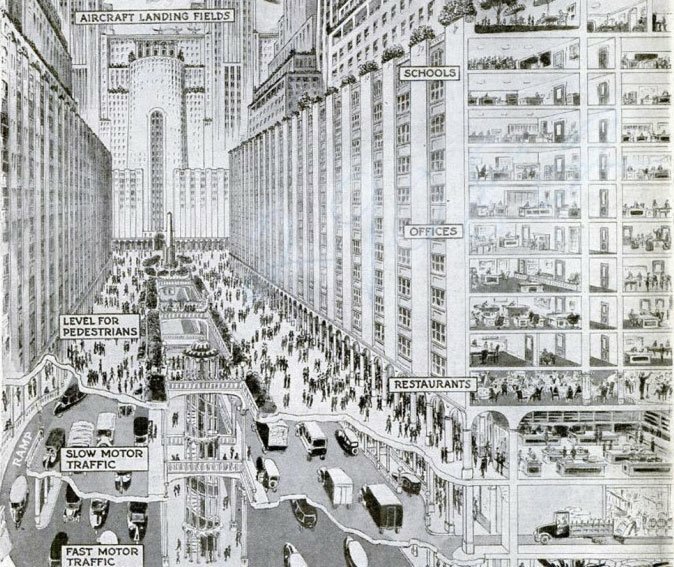 While many urbanists and architects in the ’20s predicted that suburban migrations would give way to sprawl (and it eventually did), other urban “futurists” balked at the idea of decentralization, and believed instead that Americans would be living and thriving in high-density vertical cities. 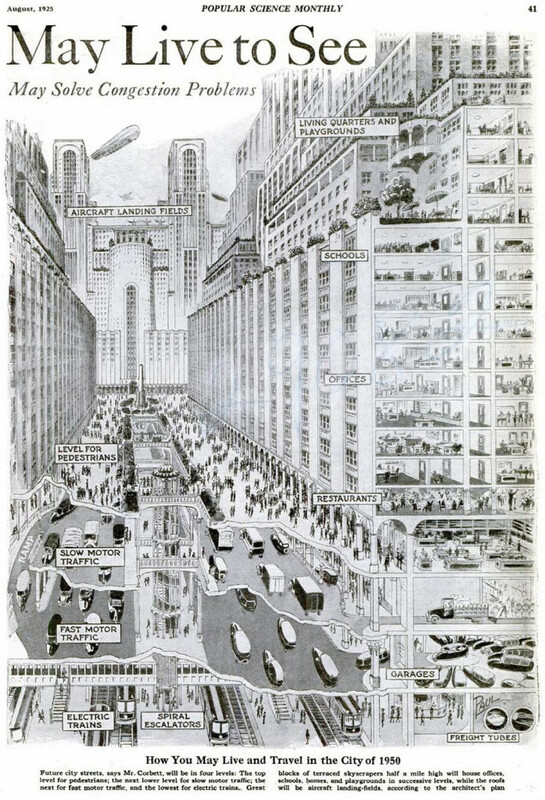 Architect Harvey W. Corbett’s “May Live to See, May Solve Congestion Problems” is one such proposal that sees everything from homes, offices, schools, green space and even aircraft landing fields stacked on top of each other for the ultimate metropolis. “Future city streets, says Mr. Corbett, will be in four levels: The top level for pedestrians; the next lower level for slow motor traffic; the next for fast motor traffic; and the lowest for electric trains. Great blocks of terraced skyscrapers half a mile high will house offices, schools, homes, and playgrounds in successive levels, while the roofs will be aircraft landing-fields, according to the architect’s plan. 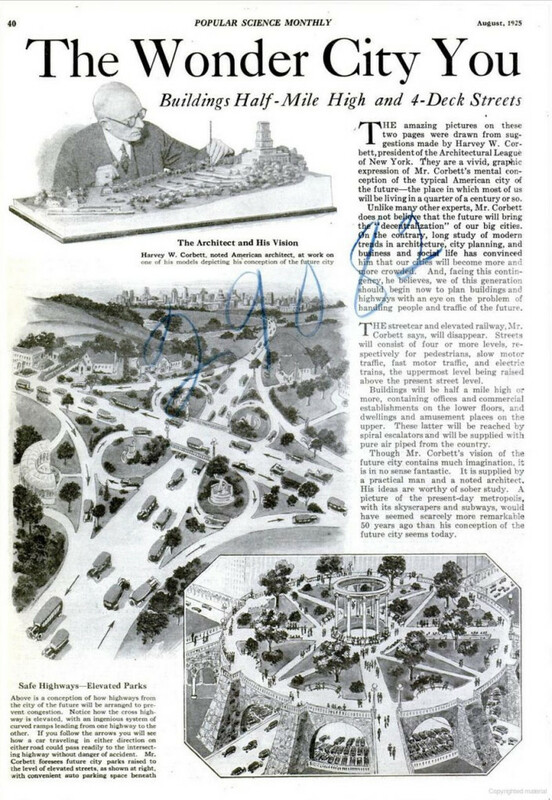 There is also of course the prediction of half-a-mile high towers, which are very much a reality today, and overcrowding. Some of the more appealing bits include giving the streets back to pedestrians while assigning underground roads to both motor traffic and subways. This vision actually was realized in small scale by Olmstead when he designed Central Park during the 1860s. He created separate roadways for coach and pedestrian traffic and the separated roads are still in use today.